We are a community of musicians who gather together to rehearse and perform the world's greatest music. Perform alongside two-time Grammy-winning clarinetist Richard Stoltzman! Click for information about the Spring 2019 season. 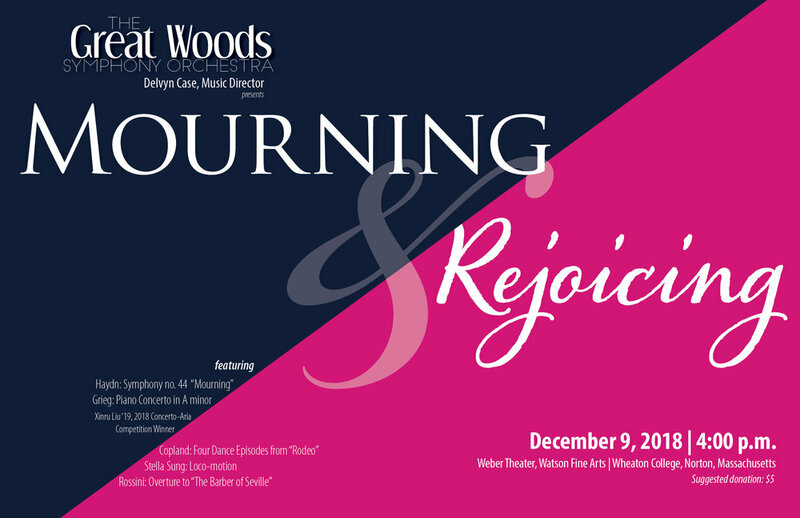 The Great Woods Symphony Orchestra is a 70-piece college-community ensemble based at Wheaton College in Norton, Massachusetts. Our mission is to provide an opportunity for musicians of all kinds to experience the excitement and joy of playing in an orchestra. We are comprised of members of the general public as well as Wheaton students, faculty, and staff. No orchestral experience is necessary. Membership is free. We are committed to performing a broad repertoire of music from around the world, especially music by composers from groups traditionally under-represented on orchestra programs. Recent performances have featured Tchaikovksy's Symphony no. 5, Dvorak's "New World" Symphony, Copland’s Rodeo, Schubert's "Unfinished" Symphony, Beethoven's Symphony no. 5, Haydn’s Symphony no. 44; concertos by Mozart, Piazzolla, Grieg, Beethoven, and Bach; plus overtures and suites by composers ranging from Mendelssohn to Scott Joplin. We routinely collaborate within nationally-prominent artists. In recent seasons we have performed along with violinist Victor Romanul of the Boston Symphony, trombonist Achilles Liarmakopoulos of the Canadian Brass, violinist/composer Daniel Bernard Roumain (DBR), multi-media artist DJ Spooky, and guitarist Aaron Larget-Caplan. We also frequently perform with Wheaton faculty soloists and student winners of out Concerto-Aria Competition. The Spring 2018 repertoire featured folk-music-inspired pieces from six continents, including THE MISSISSIPPI RIVER by Florence Price, the first African-American woman to have music performed by a major orchestra. Scroll down for posters from our previous concerts!